Begin with the Bin created this infographic detailing how to best sustainably dispose of food items commonly present at a Thanksgiving table. The National Waste & Recycling Association (NW&RA) has produced an infographic offering helpful tips for composting and recycling for a green Thanksgiving. As families across the country sit down to celebrate Thanksgiving, many Americans are thankful for a fantastic feast. And with the feast comes the challenge of dealing with an influx of food waste, but also an opportunity for increased participation in composting and recycling. The National Waste & Recycling Association (NW&RA) has produced an infographic offering helpful tips for composting and recycling for a green Thanksgiving. 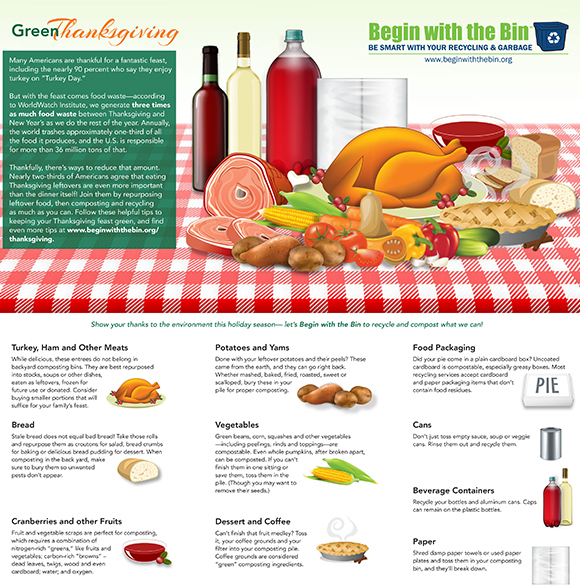 To download a version of the infographic, please visit beginwiththebin.org/thanksgiving. According to WorldWatch Institute, we generate three times as much food waste between Thanksgiving and New Year’s as we do the rest of the year. Annually, the world trashes approximately one-third of all the food it produces, and the U.S. is responsible for more than 36 million tons of that. Thankfully, there’s ways to reduce that amount. Nearly two-thirds of Americans agree that eating Thanksgiving leftovers are even more important than the dinner itself! For them, leftovers may be the highlight of the holiday season, but there are other ways to make your holiday more sustainable. Turkey, Ham and Other Meats: While delicious, these entrees do not belong in backyard composting bins. They are best repurposed into stocks, soups or other dishes, eaten as leftovers, frozen for future use or donated. Consider buying smaller portions that will suffice for your family’s feast. Bread: Stale bread does not equal bad bread! Take those rolls and repurpose them as croutons for salad, bread crumbs for baking or delicious bread pudding for dessert. When composting in the back yard, make sure to bury them so unwanted pests don’t appear. Cranberries and other Fruits: Fruit and vegetable scraps are perfect for composting, which requires a combination of nitrogen-rich “greens,” like fruits and vegetables; carbon-rich “browns” – dead leaves, twigs, wood and even cardboard; water; and oxygen. Potatoes and Yams: Done with your leftover potatoes and their peels? These came from the earth, and they can go right back. Whether mashed, baked, fried, roasted, sweet or scalloped, bury these in your pile for proper composting. Dessert and Coffee: Can’t finish that fruit medley? Toss it, your coffee grounds and your filter into your composting pile. Coffee grounds are considered “green” composting ingredients. Food Packaging: Did your pie come in a plain cardboard box? Uncoated cardboard is compostable, especially greasy boxes. Most recycling services accept cardboard and paper packaging items that don’t contain food residues. Cans: Don’t just toss empty sauce, soup or veggie cans. Rinse them out and recycle them. Beverage Containers: Recycle your bottles and aluminum cans. Caps can remain on the plastic bottles. Paper: Shred damp paper towels or used paper plates and toss them in your composting bin, and they’ll break down. 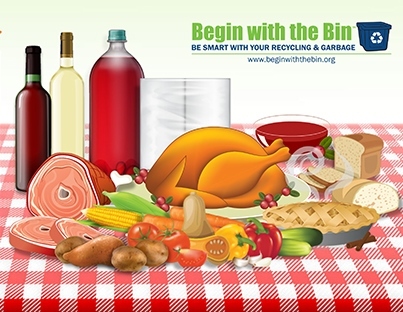 For more information on Thanksgiving composting, visit www.beginwiththebin.org/thanksgiving.